GeForce Experience has proven itself an effective tool for gamers, downloading drivers, recommending optimal settings for leading titles, tailored to the system specifications of each user’s system. On October 28th NVIDIA will be releasing GeForce Experience 1.7 on GeForce.com and through the in-app automatic updater. In addition to the latest Optimal Settings updates and a few other surprises, GeForce Experience 1.7 will introduce GeForce ShadowPlay Beta, a highly anticipated gameplay capture tool. Fast, free and easy-to-use, ShadowPlay is a new approach to gameplay recording, utilizing an on-board H.264 encoder built into GeForce GTX 600 and 700 Series graphics cards, and an innovative recording mode that shadows your every in-game move. The eponymous Shadow Mode follows your gameplay, saving the last ten to twenty minutes of action to a temporary buffer on your hard drive. When you pull off a particularly impressive in-game move, hit Alt + F10 to save the buffered footage to a permanent file, enabling you to capture your best exploits even after the fact. To prevent your HDD from piling up with large video files, files are not created automatically; ShadowPlay saves a clip only when you press the hotkey. The footage you do save can subsequently be edited with popular editors like Sony Vegas, Adobe Premier, the free Windows Movie Maker or any other .mp4-compatible video editor, and uploaded to YouTube to share with friends or the World Wide Web. Alternatively, upload the unedited file directly to YouTube and use the on-site tools to edit the capture to your liking. In a future GeForce Experience update we will introduce Twitch streaming, enabling ShadowPlay users to stream captured gameplay direct to Twitch. ShadowPlay leverages the H.264 hardware encoder found on GeForce GTX 600 and 700 Series graphics cards to record 1920x1080, 60 frames per second. All DirectX 9 and newer games are supported. In comparison to software solutions that hammer the CPU, ShadowPlay’s hardware solution has an approximate 5-10% performance impact when using the max-quality 50 mbps recording mode, and by saving to automatically-encoded and compressed H.264 .mp4 files, ShadowPlay avoids the disk-thrashing, humongous, multi-gigabyte files associated with other gameplay recording applications. When streaming with Twitch in a future GeForce Experience release, this minimal performance impact will ensure competitive multiplayer matches aren’t compromised by high CPU usage or hard disk thrashing. If you prefer to save every single moment, enable Manual Mode with the rebindable Alt + F9 hotkey, which acts like traditional gameplay recorders, saving your entire session to disk. Windows 7 files cap out at 4GB per file due to OS limitations, but on Windows 8 and Windows 8.1, file size is only limited by available hard disk space, enabling hours of footage to be recorded to a single file. 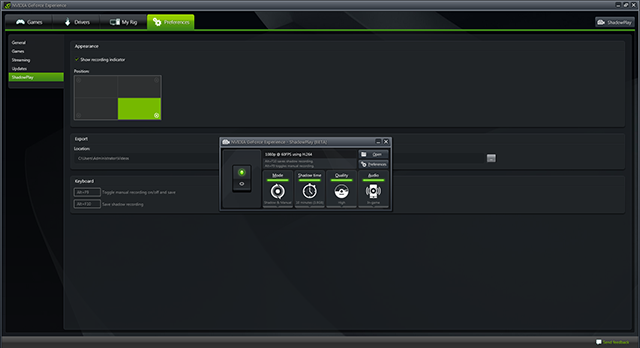 To get started with GeForce ShadowPlay Beta on October 28th, you’ll need a GeForce GTX 650 or higher desktop GPU, the latest Geforce drivers, and GeForce Experience 1.7, which will be available through GeForce.com and the in-app update tool.